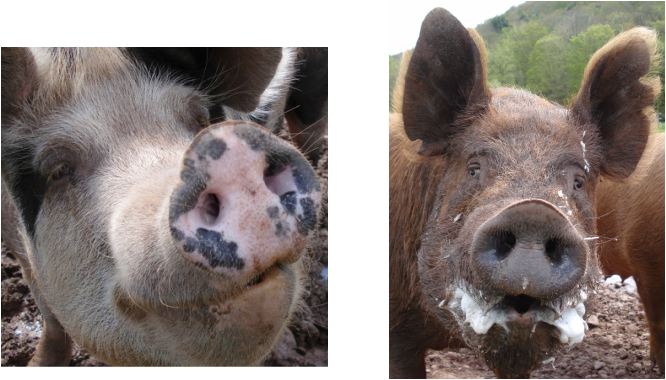 Our first breeding pigs were a pair of Tamworths named Curley and June. They were so cute and so in love. Junie Pig was the ideal sow; A wonderful mother who had big litters, was always pleasant to be around and she would walk right onto the trailer without any persuasion every time she had to be moved to a different pen. We have never had another pig sit like her. And Curley! If you called his name, he'd come running, and his most favorite thing in the world, aside from June, was raspberries. He would take a raspberry out of your hand so gently with the very tips of his lips and really savor every little drupelet. So cute. We miss them both dearly, but still have some of their descendants on the farm today. We keep our pigs in large pens outside in the valley year round. They have Port-A-Huts for shelter, which we bed well with straw in the cold months. For many years we have bred mostly Tamworths. They are very resillient to adverse climates and have no trouble wih the cold mountain winters here. At the moment we have three Tamworth boars and ten Tamworth sows, along with five Gloucestershire Old Spot sows and our young GOS boar, "Black Jack." His ear tag is 21 and he's from the black color group. We sell our piglets either as registered breeding stock, or unregistered for meat. They are sold as weanlings from spring through autumn, and occasionally an older breeding animal is available. Usually in the spring we have a waiting list for piglets, but if you are interested or have any questions about our set-up feel free to contact us.